What is the Daming Palace? As a UNESCO World Cultural Heritage site, the DaMing Palace and Park was originally built in 634 in Xi’an. 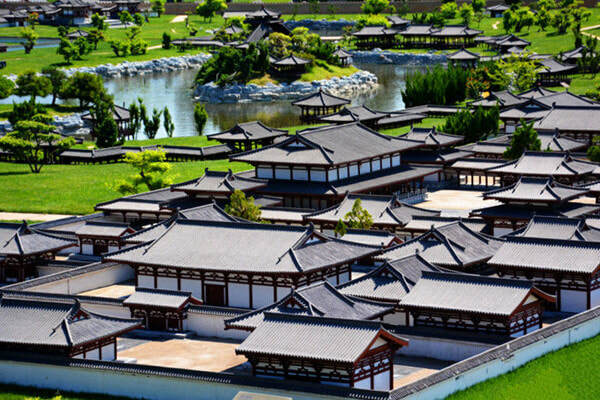 The palace was the most gorgeous palace complex in the Tang Dynasty with an area of 3.2 square kilometers. Unfortunately, the palace was destroyed in the war at the end of Tang Dynasty. DaMing Palace and Park was originally built in 634 but destroyed in the war at the end of the Tang Dynasty. The wall of the original palace has a circumference of 7.6 kilometers with 11 gates on four sides. Visitors can explore more than 40 ruins, including bases of palaces, appreciate the restored miniature view of DaMing Palace, and visit the Danfeng Gate Ruins Museum (丹凤门遗址博物馆) where the pier and abutment of Danfeng Gate is well-preserved, the ruins of Xuanzhen Palace, Hanyuan Palace and Zichen Palace. In the park, visitors can explore the cultural relics in the Tang Dynasty, such as royal utensils and the like. In addition, if interested, visitors can also personally experience the archaeological excavation and restoration of cultural relics at the Archaeological Discovery Center on the northwest of the Danfeng Gate. Visitors can watch the IMAX 3D documentary of “DaMing Palace Legend” to get acquainted with the history of the palace. The best time to visit DaMing Palace and Park is in the morning or in the afternoon. It is hot at noon, especially at noon in summer. The best months to visit are from March to May, and from September to October. DaMing Palace and Park is situated in downtown Xi’an. Therefore, there are some options. Rent a vehicle to DaMing Palace and Park. This is the quickest and most direct option. Take Bus 2, 262, 528, 717 and Bus 723 to the Stop of DaMinggong Danfengmen (大明宫丹凤门站). Enter the park through the South Gate. Take Bus 16, 17, 22, 38, 46, 104, 209, 216, 262, 263, 287, 289, 309, 517, and Bus 703 to the Stop of Dahua 1935 (大华1935站). Enter the park through the East Gate. Take Bus 2, 17, 22, 38, 36, K46, 104, 209, 216, 263, 309, 409, 517, 703, 801 and Bus 913 to the Stop of Daminggong Guojia Yizhi Gongyuan (大明宫国家遗址公园站). Enter the park through the East Gate. The park offers English interpretation service. The number of the group is 10 persons at most. The pricing for the service is 300 CNY per hour. The park offers audio-guide. The rental is 30 CNY per person. The buildings in the park are mainly ruins, with less shade. Please avoid long walking in the park at noon in summer. Visitors can rent a bike to cycle in the park. Interested in visiting the Daming Palace on a Tour? Wendy Wei Tours offers a variety of different packaged tours as well as custom tours including the Daming Palace, among other attractions and destinations. To find out more, please visit our Tours page or Contact Us directly to find out more.